Jump to video Should Perry camp name disqualify him from race? Republican presidential candidate, Texas Gov. 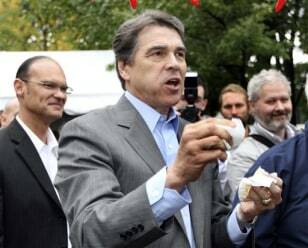 Rick Perry reacts after taking a bite of chili during a campaign stop a the Chili Festival Saturday, Oct. 1, 2011, in Manchester, N.H.